Adrian Bakelaar first opened Bakelaar Jewellers in 1936 in Veenendaal, The Netherlands. This is an interesting tale on how a son can be disinherited when he does not take on the family farm. Adrian did not have an easy life. Leaving the family farm in the early 1920’s Adrian started to learn his trade as watch maker under the watchful eye of his employer. 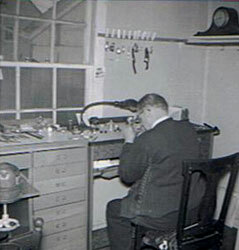 Working hard Adrian received his watch maker certificate in 1926. Adrian had won the heart of a young lady close to the family farm and she too was to stay and live close to her family. She also had to sneak away in order to spend her life with the man of her dreams. After a rough start the family started Bakelaar Jewellers a jewellery and optometrist shop. Running the store for the next fifteen years, they were able to make a living even threw the war and depression. In 1952 Canada was calling! Again a rough time was to be had as the family of six had to be separated as boarding together was not an option. The family found themselves working in Toronto, Ontario for an optometrist for a year. Then realizing this was not good for the family Adrian moved them to Tillsonburg, Ontario. Neil Bakelaar grew up in the business. Neil worked as an apprentice in Holland with an extensive training in the Optics as this was part of the coarse. At the age of 20, when the family moved to Canada, Neil started working as an optometrist in Toronto, Ontario. One year later he found himself working with his Dad in Tillsonberg, Ontario for a jeweller. The excitement mounted when the two of them opened a store in Ingersoll but soon faded when Neil’s dad had two heart attacks. Selling the business was discouraging but a necessity, Neil found himself going to work for yet another jeweller to help pay the bills at home. During these two years when Neil’s dad was building up strength again and able to do his own trade work Neil met the love of his life – Alice. Getting married in 1958 the two of them began to dream of having their own store. So in 1960 that dream was realized. Working round the clock they built up their reputation in Tavistock for the next seven years. During this time Neil was taking coarse to become a Master Watch Maker. When an opportunity to purchase a jewellery store in Listowel came their way, the growing family moved. He is also a clock repair man, a life experienced jeweller and gold smith. 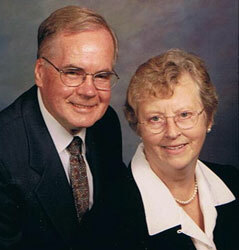 Alice Bakelaar became Neil’s right hand when he was studying and working. Alice admits to learning to balance the books from a very nice lady in Tavistock who came to the house after hours to teach Alice the basics of finances in running a successful business. Life experience both good and bad are good teachers of running a business. Hard work and good product knowledge help to run a good business. The team found themselves working hard to grow the successful Retail store in Listowel. Neil and Alice have worked hard both in Tavistock and Listowel with 43 years of running a successful business. The Listowel store is still in business today with one of the sons taking over from them in 2003. Neil and Alice have instilled in their children the love of serving others as two of the children own jewellery stores, one a police officer and one making splints for arthritic knuckles. They find themselves still cleaning clocks – Neil the inside works and Alice the clock case working together as a team. Like his Dad, Adrian grew up in the Jewellery business. After school usually found Adrian working at the store where he remembers the big fashion wave on charm bracelets. “I got so tired of soldering on all those little charms” Adrian remembers. He literally received his training on the knee of his father, learning the skills and style of jewellery creation, repair and sales. This lifetime of experience has been his main teacher, but Adrian has also studied in Toronto both at Humber College and George Brown College in the fields of design, jewellery repair and stone setting. 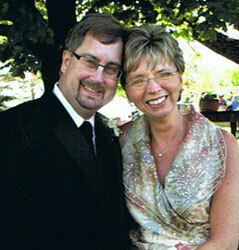 Adrian started his first business with his wife Maria in Wingham, Ontario in 1984. “I have always enjoyed working with the public. It is very rewarding to do repairs and do them well” Adrian remarks. He is a qualified gold smith and does the vast majority of gold smithing right in the store, offering quick and efficient service, from the hands of a craftsman. Change comes quickly in business as well as in personal life and, with three of our four children starting new schools in September 2002, the family moved to Exeter to embark on a new adventure. Bakelaar Jewellers (Exeter) was founded in 1989 with Adrian’s youngest brother, Derek running the store. Derek, wanting his own changes, moved-on and the opportunity was put before Adrian and Maria to continue the store. The Exeter store has taken-on new challenges including specialized design as well as the creation of unique custom pieces and has proved very rewarding. The new computerized engraver adds a great new service to the store and complements the custom design by enabling the creation of pieces for the most discerning customers. Maria grew up as a farmers’ daughter. Since grade 10 Maria has been an avid “Rock Hound” and is happiest when learning about the different stones in earth\’s cavities and veins. The art of tumbling stones along with the beauty and color of precious gemstones is a passion greatly suited to a Jewellers’ wife. Maria had experience in retail sales before meeting Adrian. Obviously the chance to be with her beloved stones, beautiful jewellery and her family keeps Maria at the store when not running that other family business, the one with four children to look after! Adrian and Maria look forward to meeting you in the store and continuing the family tradition of craftsmanship, service and excellence in Canadian jewellery.